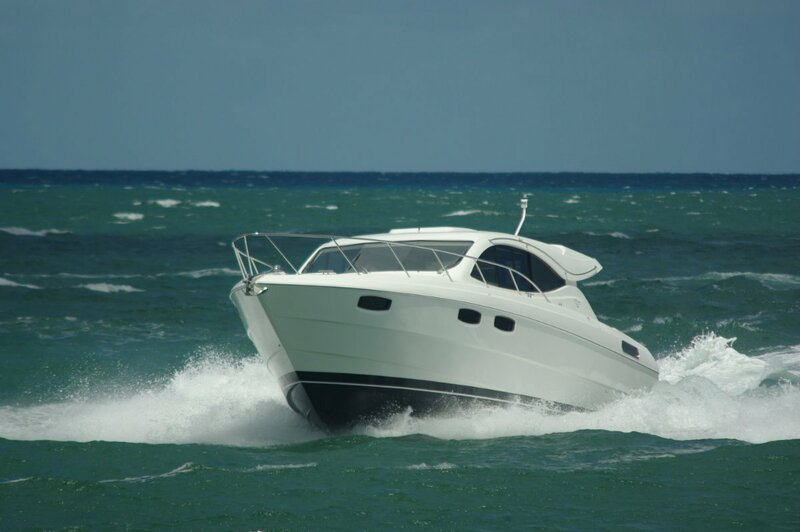 The Mustang brand name has had several homes over the years, but is now securely in the hands of Maritimo. 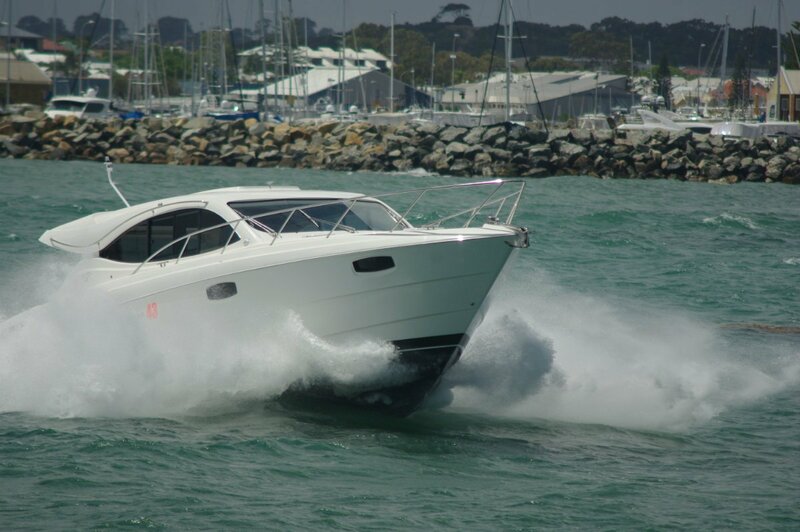 The review boat, the Mustang 43 Sports Cruiser, has no links at all with any previous models; this is a completely new design by Maritimo. Maritimo’s strategy with Mustangs seems to be aimed at producing a well-equipped boat at an attractive price. To achieve this some items that might otherwise be powered, such as the sun roof and the lowering galley window, work manually. The standard engines are Volvo D6s sterndrives, considerably cheaper than shaft drives. But the options list allows a buyer to make the 43 as de luxe as he wants, and the five choices of power plant include Volvo’s IPS pod drives as well as shafts. The 43 makes good use of every foot of length. 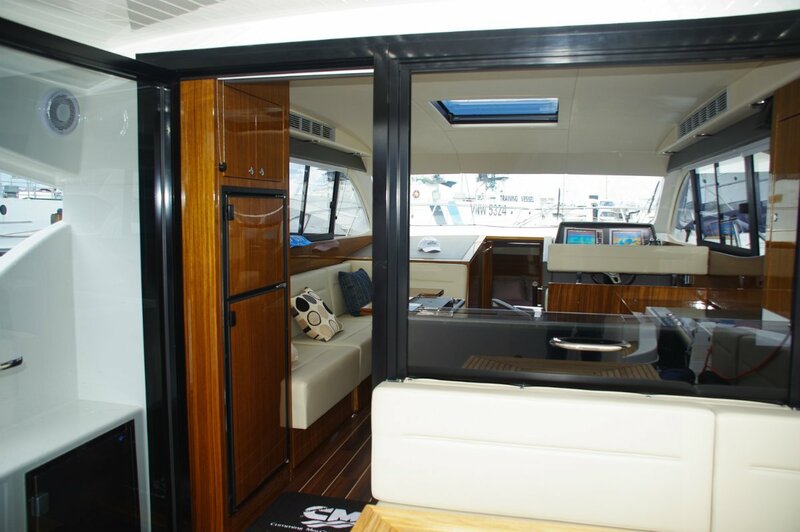 The links between cockpit and saloon almost make a single space out of two, with the combination of a large glass door and the serving hatch from the galley at the saloon’s rear. The timber decked cockpit is almost an outdoor saloon, half shaded by a hardtop. It has a settee and table, electric barbecue and large and small fridges. Most of the deck power lifts to expose the engine room so, in the interests of not annoying people seated at the table, a smaller hatch in the saloon allows the motors’ daily inspection. The galley takes up the saloon’s after bulkhead, and continues up the starboard side. The lid of a locker at its end lifts to reveal the thinnest TV screen I have ever seen. This is for the benefit of those seated in the L-shaped lounge opposite. A tricky table in the lounge’s midst adjusts in shape and size to suit meals or snacks. A neat idea was to use the lounge backrests as part of the lining: pull them from their Velcro anchors to expose the services running between lining and hull. 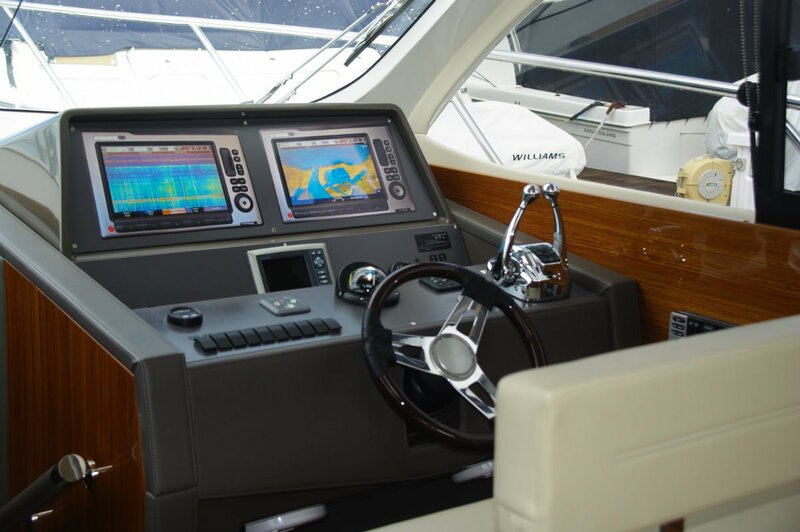 The driving position to starboard comfortably seats two and has that rarity, an adjustable footrest. The dash is utterly contemporary, like the all-glass cockpit of a jet fighter – although a lot simpler. The view ahead from here is superb through a three piece all-glass windscreen – no mullions, the glass being linked by silicon. The 43 is air conditioned throughout, but is provided with plenty of natural ventilation too. With fore hatch, the four sleeping cabin windows, the saloon side windows, the door and sun roof open, the slightest breeze at anchor will make the interior habitable. The sleeping accommodation is the usual two-cabin, one bathroom arrangement for boats of this size, but there are some new ideas. There might be only one of them, but the builders gave that bathroom serious size: all the elbow room for vigorous towelling. The second, midships cabin, partially located under the saloon deck, can sleep four. Besides the double bed, a settee converts into a double-decker bunk, making this a suitable cabin for guests with a couple of children. 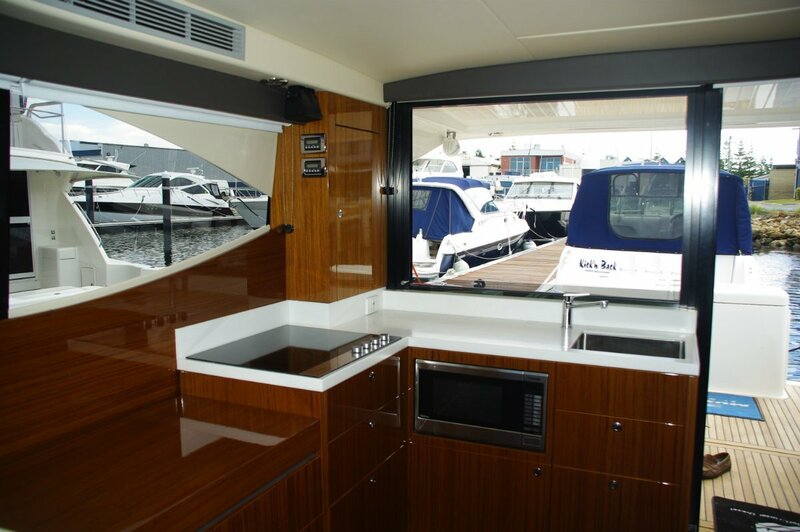 The owners would choose the fore cabin, which has a decent amount of space, an excellent bed, and ample hanging space. 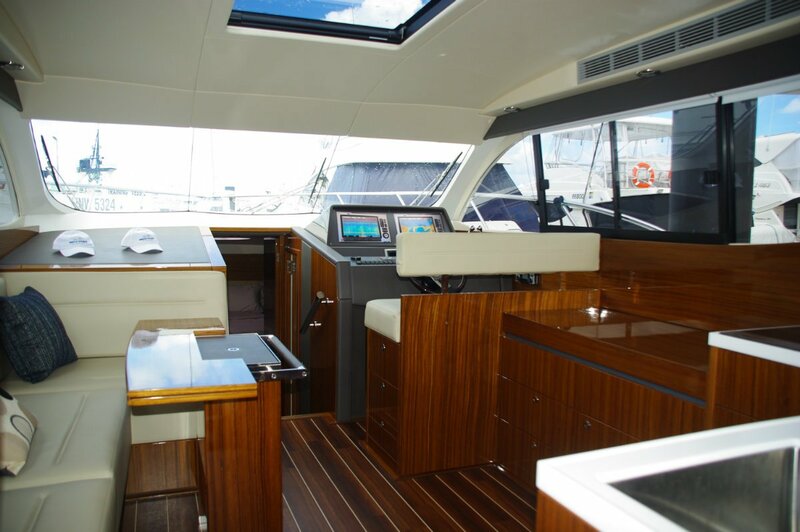 Like the rest of the accommodation, the fit-out of the lower deck features much varnished timber veneer: easily maintained and easy on the eye. The Cummins, turning five-blade propellers, give the 43 a top speed of 33 knots. 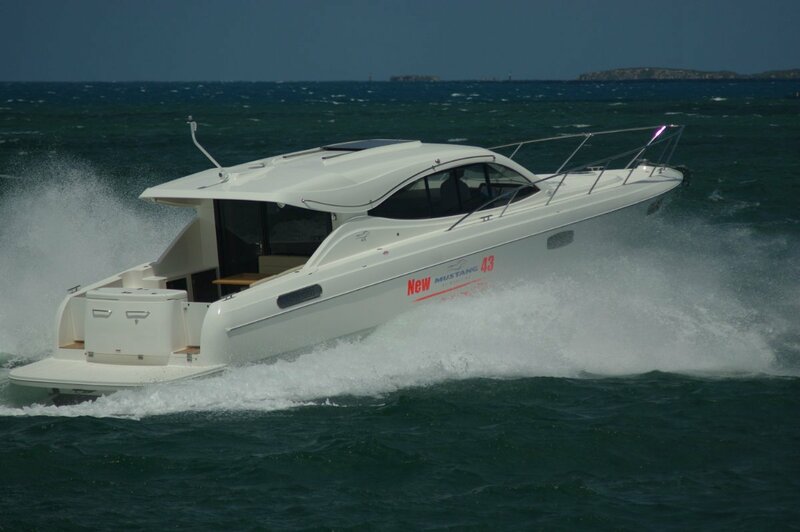 The boat’s efficiency at lower speeds is remarkable, the fuel consumption at speeds from 11 to 23 knots varying only a whisker. The tanks have enough theoretical range to take the 43 to the Abrolhos and then Geraldton at 23 knots, with 20 percent of their contents left in reserve. The review did not use much of the range, but it took place in testing weather: 20 to 25 knot winds providing significant seas. The 43 came through with a very steady performance and barely a drop of water on the windscreen.